5 Seconds of Summer is a pop punk/pop rock band from Australia. The band was formed in Sydney back in 2011. The popular band consists of its very popular members Luke Hemmings, Calum Hood, Michael Clifford and Ashton Irwin. 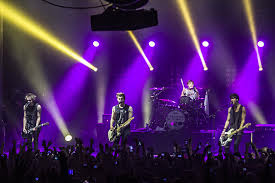 5 Seconds Of Summer in one of their performances. The members of 5 Seconds of Summer don't seem to have that huge differences in terms of height. They are almost of the same height measurement. Luke Hemmings - He is the tallest among the boys of 5SOS. Luke Hemmings is estimated to be 1.87 m tall. That would make Luke's height at 6 ft 2 in. Meanwhile, as of writing, he is listed by Google at 193 cm which is 6 ft 4 in. Calum Hood - Calum's height is 1.76 m. But I think he is taller than this height estimate, because I can see from their photos on the web that Calum is very nearly as tall as Luke. Michael Clifford - He is 1.76 m.
Ashton Irwin - Ashton Irwin stands at 1.77 m.
Luke Hemmings Height Is 6'4"
Luke's height has been very controversial for the fans and also for the non fans. Some avid fans would say that Luke is 6'4" tall, while some would say that he is only 6'2". Google on the other side says that he is 6'4" by listing him in their height widget in their search results at 1.93 cm. Try searching "Luke Hemmings height" in Google and see it for yourself. Then there was a photo circulating in the web that shows Luke's height being measured. According to articles that I have read about this photo, Luke would be 6'4" tall if his quiff would be included in the measuring. It turns out its the quiff that makes him 6'4". The measuring concluded that Luke's height is 6'2". I've read he said that he is 6'2" too.